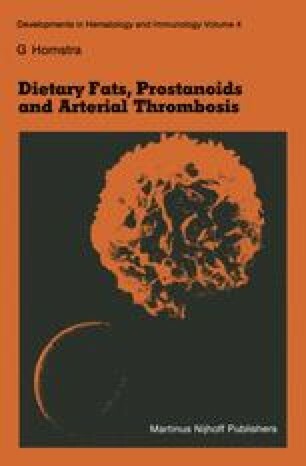 The studies reported in Chapters 4, 5 and 6 show that replacing dietary saturated fatty acids by polyunsaturated fatty acids contributes to the prevention of arterial thrombosis in rats. Although these experimental results have been confirmed by many other investigators using a great variety of animal models (for reviews, see refs. 390 and 687), it is not justified to extrapolate these animal data to the human situation. Animal data only provide a guideline for human studies and therefore it is particularly worthwhile to investigate whether replacement of saturated fats by linoleic acid-rich oils also has an antithrombotic and antiatherosclerotic effect in human subjects. Epidemiological studies would suggest this to be likely because the intake of saturated fat is the environmental factor most closely associated with coronary heart disease [363, 743, 781, 782]. The value of epidemiological studies is rather limited, however, because they only detect associations and do not prove any cause-effect relationships. For this purpose, prospective clinical trials have been performed, which all indicate a favourable effect on atherosclerotic complications of a diet low in saturated fats and enriched with linoleic acid [175, 487, 552]. To find out whether this effect is associated with changes in platelet thrombotic functions, as was shown to be the case in rats (Chapter 5), we investigated the influence of a linoleic acid enriched diet on platelet aggregability in man .